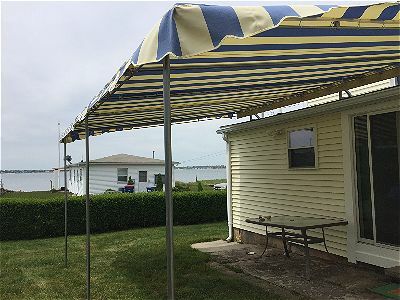 This pipe frame patio awning is right on the water. 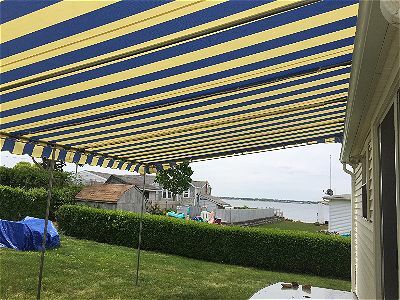 This canvas patio canopy is right on the water on Sconticut Neck in Fairhaven, MA. With no existing deck or stone patio, we needed to frame the awning in and dig concrete footings in order to secure the posts to the ground. This presented a challenge in the layout but as always, with our vast amount of experience it proved to work out just great. 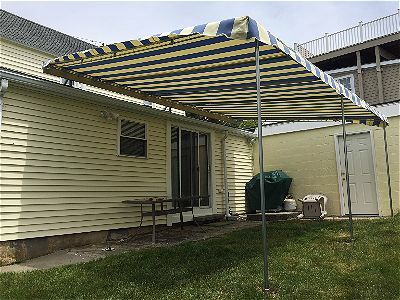 Another view of this large, roof mounted patio canopy. The view from underneath the patio canopy, overlooking the water. As always when putting a canopy on the water, wind is a main concern. With our design, fittings, and expert installation, the wind is not a concern for our customers.